Relationships Through The Years | It's In The Sauce! When asked, most people would list relationships, especially family and friends, as most important, yet their calendar would indicate otherwise. This time of the year many are with family more than at other times. But what about friends? Do you make it a priority to schedule concentrated time with friends? While I often write about that which I need to hear, my calendar reflects I make time with friends a priority. My husband and I just returned home from a wonderful three- day weekend with three other couples at our beach place. Three of these couples have been friends for more than 30 years. The other couple is a more recent friendship to me and Mike, yet it feels like a thirty- year friendship. We live in different cities, yet make the effort to get together for a weekend 2-3 times a year, and the other three couples even more often since they live and/or have property in the same city. On these weekends we cook, eat, have long talks, shop, play golf, and relax. Technology is not the focus of these times together, connecting on a fun and meaningful level is our priority. 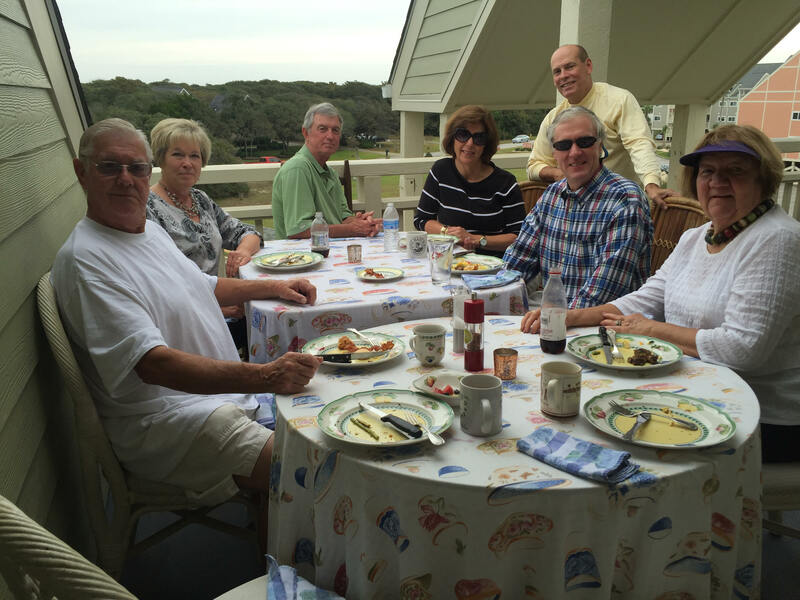 On this recent weekend we had six al fresco meals, sunset watching on the deck, and much conversation. I am always nourished from these times together, and in more ways than the food. We all have children and spend time with them throughout the year, as well as other family. We all have other friends, and spend time with them as well. Most of us still work, and have busy social lives. Even so, we make time together with these couples friends a priority. I think there is great value in making the time and effort to keep relationships like this alive, and it takes time and effort to do so. We are in another group of couples that get together once a year as guests of one of the couples. There are five couples in this group, and the hosts insist on doing most of the cooking, and sometimes all of it! We have other couples friends that we have been close to thorough the years, and still are, yet we don’t make the same time and effort to be together on a scheduled basis. And being too busy should not be an excuse for us; everyone is busy. And then there are friends who were couples friends, and one of them is no longer here. We all know that losing a spouse will happen to all of some at some point. Well, we all “know” that, but fail to keep the reality of that in focus enough or we would make some different decisions. This reality reminds me of a question a close friend of mine asks herself since her husband died. “What would I have done or said if I had known that would be the last time I would see him?” Those of us who still have our spouse should reword that and not forget that life can change on the dime, and an ordinary day can become an extraordinary one. And then, divorce or other separation has divided some couples friends. And unfortunately, there are friends from whom we are estranged, for different reasons. I am thinking of one friend who lost a very close friendship with a couple who had been more family than friends. This break was due to differences that should have not reached the level they did, but competition, jealousy, and pride severed the relationship. After many attempts to repair the relationship, my friend finally decided that it was damaged past the point where that would be possible. Still, the sense of loss is profound. If you are fortunate enough to have couples friends and aren’t spending scheduled time with them, you can change that if you want to, with a commitment to do so. If you need to develop those relationships, take the first step. The time commitment of course does not have to be two to three weekends a year. Decide together whatever regularity is doable and that will keep the connection alive. A few words for young couples. Make time together with your friends a priority. Yes, many of you have small children, work fulltime, and do not have as much disposable income as you need. Do it anyway. It may be a once a month or quarter dinner together, that could very well grow into more through the years. And put the technology down when you are together and connect on a human level. From your example your children will learn the value of close relationships. Community on a larger scale can result. And couldn’t we all benefit from that? This entry was posted in Relationships and tagged friendship, friendships, relationships. Bookmark the permalink.